It's that time of year again, it's Wrestlemania season and speculation is rife as to what matches fans will be treated to and also who will be competing for both the RAW and Smackdown championship titles. What Are The Odds looks at the latest odds on how the two main events are shaping up. Who will be the Universal Champion at Wrestlemania? It’s not uncommon for a number of wrestlers to make their Wrestlemania debut at the ‘show of shows’. However, this year, on April 3rd 2017, the WWE Universal Championship will be featured for the very first time in the main event, with current champion Kevin Owens hoping he’s the man to walk in and walk out RAW's champion. 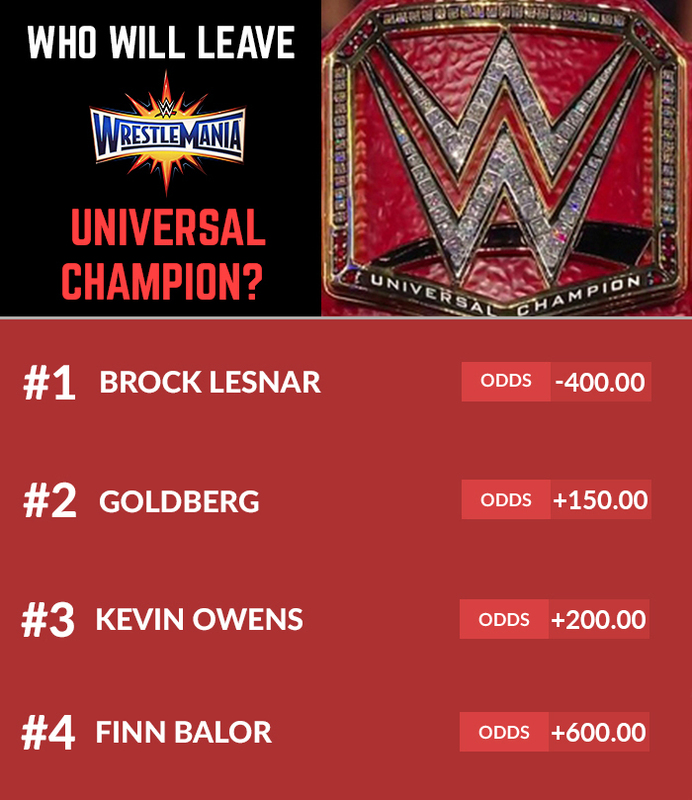 The Canadian born Kevin Owens is so far the longest reigning Universal Champion in history (albeit the title was introduced last summer), and has really been the face of the Monday night show, however he’s not the favourite to walk out champion on April 3rd in Orlando and he’s not even second favourite - instead he’s further back at 2/1 (+200.00) in the betting odds. 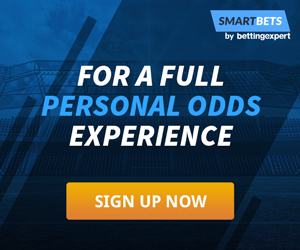 The two favourites to walk out champion may just be a giveaway as to what’s to come in the near future, with former UFC World Heavyweight Champion Brock Lesnar the man tipped to stand with his arm raised at the end of the night with short odds of 1/4 (-400.00) making him the serious favourite with the bookmaker Paddy Power. The man he’s supposedly going to beat? The legendary Goldberg who holds a 2-0 record against Lesnar in one on one matches and has the accolade of being the man to eliminate The Beast from this year’s Royal Rumble. Both men have already confirmed they will face each other at Wrestlemania, but before that, as reported on Wrestling Inc, Goldberg has a Universal title match with Kevin Owens on March 5th - what he has done to actually deserve such a match is still a bit of a head scratcher to a number of ardent WWE fans though. Multiple online sources are already tipping the two iconic wrestlers to be battling it out for the Universal Championship at Wrestlemania, which suggests Owens will drop the belt at Fastlane. If however, Owens retains at Fastlane then the long-time injured Finn Balor is just a bit further back at 5/1 (+500.00) and Chris Jericho next in line at 6/1 (+600.00). Who will be the WWE Champion at Wrestlemania? The Blue brand currently has the face of the company John Cena as the current, and 16-time WWE Champion heading onto the grandest stage of them all in Orlando. But interestingly enough, he just like Kevin Owens, is not even in the top two favourites to walk out at the end of the night as champion. That honour goes to this year’s Royal Rumble winner Randy Orton who is backed at 4/7 (-175.00) to become a nine-time WWE Champion. Orton’s current tag-team partner Bray Wyatt is the man tipped to be joining him in the main event with odds of 11/8 (+137.50) on the ‘Eater of Worlds’ to win his first ever singles championship in WWE. The Elimination Chamber pay-per-view is up first for the Smackdown brand and with the WWE Championship on the line, could a more 'surprising' name walk into Wrestlemania champion and ultimately retain? 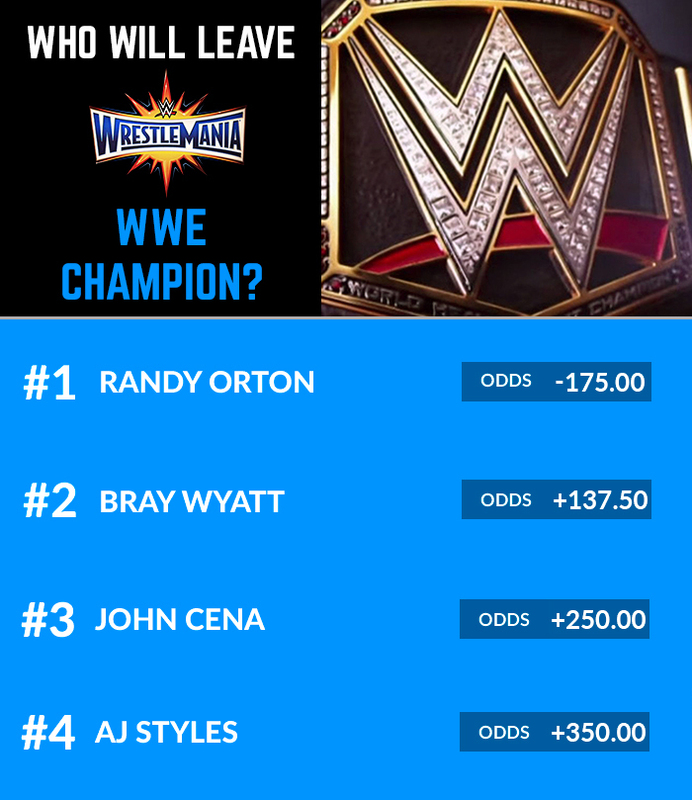 Former champion AJ Styles is the most likely if the unexpected happens on Sunday in Phoenix - he is backed by the bookmaker at 7/2 (+350.00) to be champion at the end of Wrestlemania 33. It would however seem unlikely given the way the dynamic between Randy Orton and Bray Wyatt has been cultivating over the last few months, but then again it could be another heavyweight showdown between two legendary superstars in Randy Orton and John Cena on April 3rd.